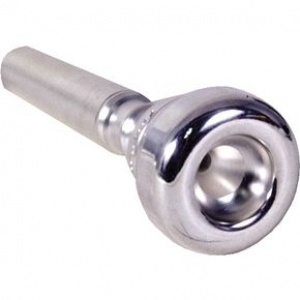 The unusual patented design of the Parduba "Double-Cup" mouthpiece enables a great ease of playing in the high register. This is noticeable the very first time that one tries this mouthpiece. After adapting to this design, it is possible to attain excellent control, and a beautiful tone is often realized when using the larger sizes such as the Numbers 5, 6, and 7.Although the cup appears to be very shallow, the lower half of the cup gives great length to the overall shape of this Double-Cup design which in turn produces a very brilliant yet rich melodic tone. One must be very careful not to over blow this mouthpiece since it takes much less effort to execute on than other types of cups.